Photo taken of the total solar eclipse on August 21, 2017 in Vienna, IL (37.416651,-88.8894326). I'm so glad we went to see the total solar eclipse yesterday. It was the best experience I've had in a long time. People were so friendly! We arrived around 7 a.m. in Vienna, IL and the park was ready to help people park for free. They had restrooms, air conditioned rooms and we ended up talking to everyone we sat by. So many interesting stories and perspectives. Some people traveled from Minnesota, Indiana, and one guy traveled west from his house, which was in the totality path, just to get better sky conditions. It was 95° F in the sun, so we were all sitting in the shade, moving our chairs every 10 minutes as the shadows moved. We shared food, stories, tips for what to look for, and stories of how we arrived and planned to depart. Some people had telescopes and binoculars with solar filters and were happy to let random people get a closer look. Everyone shared. 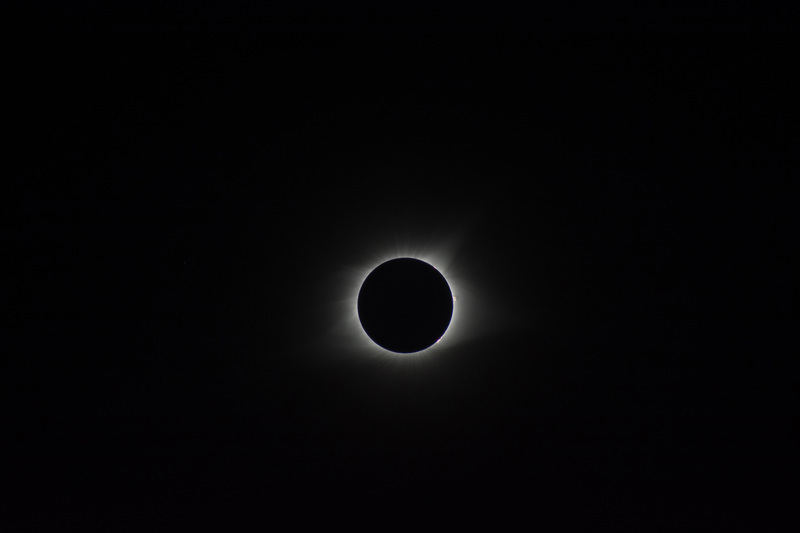 The best par BY FAR was when totality hit. Everyone cheered. It was amazing. Everyone was in awe. The crickets started chirping. The sky morphed into something none of us had experienced. We were giddy. As the sun came back into view, we started to review photos. People started swapping info. Again, we all shared. I've been emailing people all day. Traffic heading home was bad. It took us 5 hours on our way there. It took 12 hours to go back home. (!) We stopped in Pinckneyville, IL to get some dinner. Traffic was crawling. We bumped into some locals who gave us awesome directions which helped us get moving again. We ended up talking to them for 20 minutes. I can’t overstate how nice everyone was. I can’t wait for an experience to outshine this trip!